Staging a revolt against my assumptions and rebuilding myself into something marvelous. Reverb11: How did your passion inspire you? How did your passion inspire you? It’s almost a cliche to talk about find your passion or living your dreams, but in 2011 people who have chosen to follow their passion, wherever it leads them were my biggest sources of inspiration. For people guided by their passion, their dreams are their priority, and that is reflected in every decision they make. In Doctor Who there is a race called the Ood. 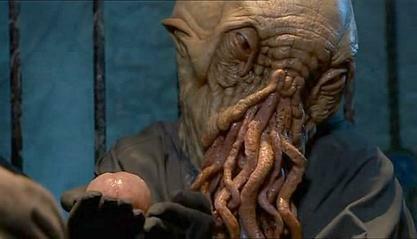 The Ood have two brains: the typical brain that resides in the head, and an auxiliary brain that they hold in one hand. Holding part of your brain in your hand tends to make you vulnerable, which may make the Ood the patron race for living your passion. Your dream is out there, being held in your hand, for everyone to see. You’re leaving that passion open to the scrutiny and criticism of anyone who cares to look. It’s a scary, scary thing. However, living in pursuit of your dream means you always have a joyful guide. If your actions will bring you closer to that dream, that’s all it takes to know you’re on the right path. Priorities become clear and life simplifies itself. (Which is not to imply that it becomes easy.) The Ood do not have names because they are one; living your dream will help you find and recognize where you belong, leading you to the people you are already one with. It’s easier to be guided by what we “should” do rather than what we’re passionate about. It’s easier to pursue “should” instead of our dreams. It’s easier to let what we think we “should” do write our core story than it is to rewrite it ourselves. What are you passionate about? What’s first step to living that dream?